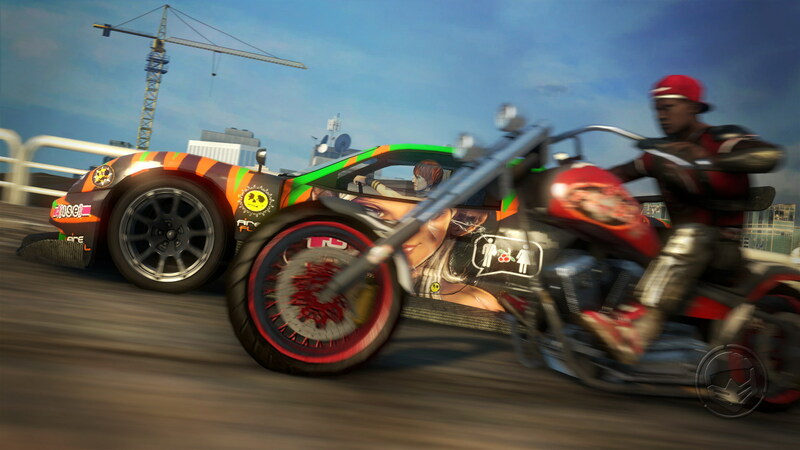 Background: I've played the original MotorStorm during the early days of the PS3's launch. The graphics, physics and intensity had instantly sold me and the races were brutally challenging online and off. The rubber band AI was beyond cheap and I still have a personal vendetta with the AI programmer making every vehicle on the track out to get me. With the sequel MotorStorm: Pacific Rift, I played the demo and was severely underwhelmed by the lack of new features aside from the obligatory split screen racing. So I completely passed on buying and playing the game because water and lava are only so-so as hooks. Gameplay: I played through the MotorStorm Apocalypse demo level three times as the supercar and twice as the superbike. The game fundamentals are very similar to Pacific Rift with the boost being able to overheat faster when hit with fire and cool faster when driving through water. There are new buttons to ram attack left and right which work slightly differently depending if you are in a car or a motorbike. Ramming other cars to their death shows a popup ala Burnout which I liked but the effort to attack other cars isn't worth the boost required to do the attacks. The supercar is supposed to be a counter to the overpowered rallycars/offroad vehicles. The supercar performance was great and it could take a beating. It felt generic to any racing game and I would say handled a lot better than a MotorStorm 1 rallycar since the supercar had better traction. I am really disappointed the crashes have less pieces flying off the vehicles compared to Motorstorm 1 and new game penalizes you for watching the crashes by not respawning the vehicle further ahead on the track based on time in the deathcam. Not much else to say about the supercar except I enjoy overboosting through the finish line to get 1st repeatedly. There is supposed to be more danger with the superbike to balance its extra speed and mobility. The strangest touches against a wall can send it flying in random directions while some slow scraps result in instant death. I also had fun ram attacking an enemy supercar and slightly moving it to the left. Yeah, I doubt a 300 pound vehicle can grind a 1 ton vehicle off its path. I crashed so many times with the bike because I enjoy seeing the exaggerated Havok ragdoll physics. Even better was when other cars crashed into my shirtless man driver who almost continued the race in the back of a trunk. A touted feature of this game is the ability for the environment to dynamically change based on the continued aftershocks and destruction around the city. In the second lap there were scripted moments where certain buildings and walls would be destroyed to open a new path. This felt very similar to how Split Second worked if any of you played that game. After playing the same level multiple times, it doesn't seem like the environment changed at all even though there is supposed to be permanence of destruction. I'll assume this will be possible in the single player races as you re-race the same courses. 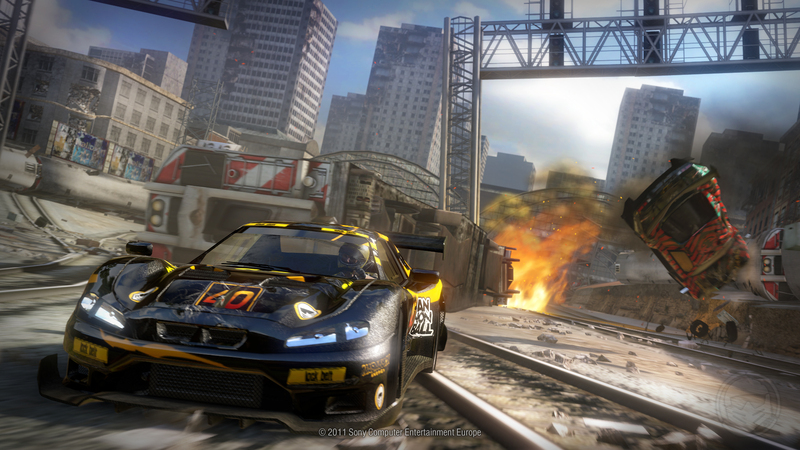 It's also very unbelievable a MotorStorm race would take place in a city where fuel and resources are surely scarce. It's also unlikely there would be aftershocks/extra city damage for the days of the race. The environment also had a Burnout Paradise feel where it was difficult to believe people lived in this city. Technical Mastery and Graphics: The loading in this game is much better only taking about 30 seconds compared with the eons of the original. I hope this is true for the retail game when it may or may not be installed to the PS3 harddrive. The framerate was very smooth and never dipped below my estimate of 30. The slowmo scripted environment destructions looked seamless unless you were doing random things like me and turning the camera sideways while driving. The rock avalanche spawned out of nowhere yet while speeding along looked natural. Evolution Studios has greatly fixed their prior issues with anti aliasing. All edges looked crisp on my screen at 720p. Evolution also fixed the HDR from being in your face to being more subtle. The game itself also feels like the vehicles are moving faster compared to the crawl of the previous games. Also surprising was the people attacking the vehicles from the side of the track looked impressive for a racing game. Overall the visuals and game engine have been much improved and done their job. Sound: The best sound is when you don't notice it at all. I did notice the supercar engines sound beefy, which is a great thing. Their RPM always feels like it is going higher even at max speed. Vehicle crash sounds are "meh" because the crunching metal doesn't make sense when the vehicle chassis is no longer taking major damage. Also the supercar crashes all sounded the same which really started to annoy me once I figured this out. The background music was exactly that, it set the mood without taking your attention out of the game. In conclusion, destruction is always a good thing in video games. I'm not exactly sold on the game because I want to see the level of destructibility the game offers before I jump in. I doubt MotorStorm Apocalypse is going to sell well in Japan due to the tragic nature of the earthquake damage and its not Initial D or an RPG. Evolution Studios has definitely stepped up their game development prowess, hopefully gamers have stepped up their game too.